a) Positive symptoms of schizophrenia- It includes hallucinations usually auditory (patients often listen commands from the sky to perform his deeds). b) Negative symptoms of schizophrenia- It includes losing interest in society including society. This is possibly results from the atrophy of the brain. 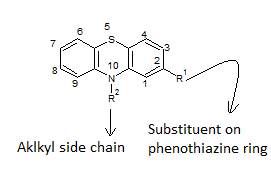 · Phenothiazines show maximum potency when N of phenothiazine is connected by 3 carbons with the N of other alkyl chain. 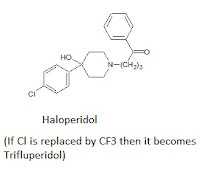 · Introduction of CH3 group at 2 or 3 of the 3-aminopropyl side chain has only minor or no effect. · Maximum neuroleptic activity is obtained with tertiary amino group. · Alkylation with larger than basic methyl group decreases the antipsychotic activity. · Piperidinyl and pyrolidinyl derivatives are somewhat less potent. · Oxidation of 5 Sulfur decreases the activity of the phenothiazines. 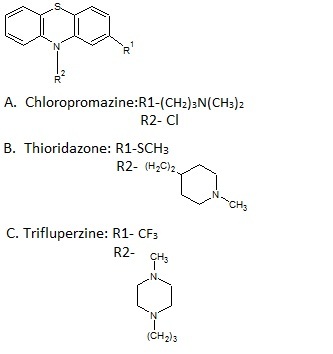 ii) Reduction of the CO group to CHOH or replacement by Sulfur decreases the potency of the butyrophenone. iii) As a rule, lengthening, shortening or branching of alkyl chain decreases the activity of butyrophenones. All neuroleptics act by by antagonizing the DA2 receptors of mesolimbic-mesofrontal pathways. As they are dopamine antagonists so they frequently produce drug induced Parkinsonism. Also dopamine is responsible for the reduced lactation hence neuroleptics cause hyperlactinemia. As dopamine produces emesis so these drugs are strong anti-emetics. 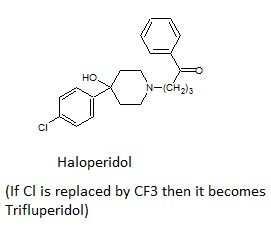 Only antipsychotic drug which do not act by this mechanism is Clozapine. Clozapine is the antagonist of Nor-adrenaline and serotonin. a) Antisychotics show synergism with sedatives, alcohol and antihistamines hence increase the action of these classes of drugs. b) When administered with pethidine it increases the respiratory depression.